Only 24 more days until Christmas! How are you counting down? Personally I wish I could be counting down with this David’s Tea '24 days of tea' advent calendar which has a different tin of tea for every day leading up to Christmas. This thing sells out every year and this season was no exception…all stock was gone in the Toronto area before the end of November! I know because I called every store like a crazy person...including the one at Toronto Pearson Airport. 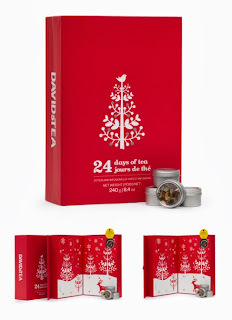 Oh well, I've already drowned my sorrows in a beauty advent calendar from The Body Shop.